In the days following Earhart’s disappearance George Palmer Putnam was deluged by people who believed that they had been in communication with his missing wife. Some claimed that they had received radio messagess from her. Recent research indicates that several of those reported receptions were technically possible and probably true. But less well-known are the many alleged communications with Earhart by paranormal means – dreams, seances, and psychic visions. 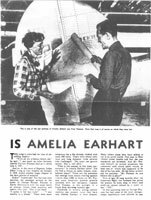 This two-part magazine article from the December 1939 and January 1940 issues of Popular Aviation provides new perspective on the chaotic post-loss environment and Putnam’s response to it. Our thanks to Ron Reuther for sharing this with us. The thumbnails below are links to the pages of the article in Adobe Acrobat PDF format. They can be viewed on line with a PDF plug-in reader, or downloaded and viewed with Acrobat. Adobe Acrobat Reader is available for free from Adobe Systems. Click on each small image to acquire the PDF.